Summer-themed update for hit mobile MMORPG, Lineage 2: Revolution has begun. Players will be able to access new content, including swim suit costumes and new in-game events in celebration of the summer. 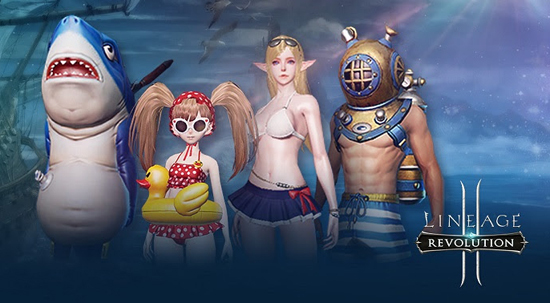 Depending on their character type, players will be able to dress in a scuba helmet/tank combination for Human, a cute two-piece for White Elf, a rubber duck floatie for Dwarf, or an inflatable shark bodysuit for Dark Elf to jump in the pool and enjoy the hot summer sun. Along with the new swim suit costumes, players will also be able to face off the Queen Ant’s Cave clan dungeon with “Very Hard” difficulty. Additionally, Class Transfer rewards are now enhanced and players will be able to receive Grade SR Exclusive Weapon Selection Box as a reward for transferring their classes. The update also adds four new in-game events, which provide extensive rewards for players until August 8. The Check-In event allows players to log-in for seven days and receive items necessary for leveling up equipment, including a Grade SR Armor Selection Box by the end of the seven day period. Herald’s Love for Animal event provides players web content to acquire trackers that can be exchanged for various rewards. Furthermore, Aymel’s School-Monster Collector event allows players to collect Monster Cores to complete quests to receive grade-specific rewards and additional rewards depending on the total number of quests completed. Additionally, entry level for the ‘Hell Difficulty’ for the Trials of Experience will be lowered from 220 to 190 during the event period, allowing more players to enter and earn the chance to receive extensive EXP rewards.